In 1904 the convention was held in Winnipeg, Manitoba, Canada. Featuring the latest technologies, over 200,000 people attended the exposition. There was one major tragedy when a lot of people climbed a roof to try and watch an exhibition for free. The roof collapsed from the weight. 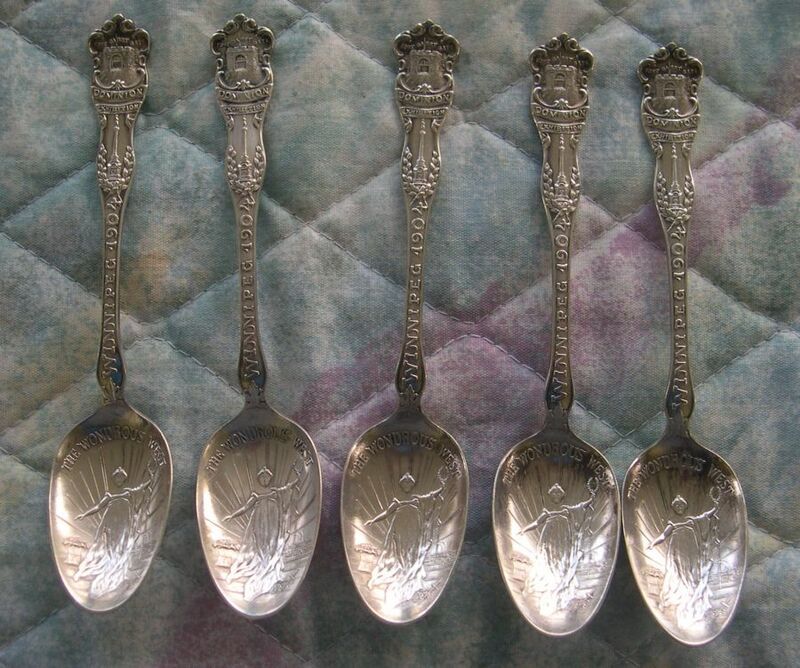 These are really very lovely art nuevo style 5 1/2'" tea sized spoons from this Expo. The finial features "the Fort Garry Gate"
The limestone gate is the only remaining part of the fort which was the home of the Hudson Bay Company and the center of the Red River Colony. I can't find a picture of the tower before it was changed in 1920. The handle says " Winnipeg 1904"
but apparently they did make some custom one of a kind spoons for the local Scottish Rite Reunions. I suspect that these spoons were part of a very small production. The bowl features an embossed allegorical woman clothed in a long robe and holding a victory wreath in her left hand with the sun rays behind her. and is captioned "The Wondrous West"
A sheaf of wheat is near her right leg. The metal purity is not marked, so I am assuming it is silver plated, but it does need to be tested as this is very fine quality workmanship. Set is not available for sale, but individual spoon may be purchased.